Click Here to watch a short explanatory video regarding funding and business elements. PRO-LINK STATEMENT TO THE IOW TRANSPORT INFRASTRUCTURE TASK-FORCE -23 SEPT 2016. The PRO-LINK ethos is to facilitate a means whereby islanders have a similar freedom of access to the opportunities and aspirations that others enjoy on mainland Britain. While respecting that throughout the islands history, the uniqueness of being a substantial population “cut off” from the evolution of progress has been considered a blessing for some, the time has now come to change its path into the future. Ferry crossing schedules have been severely reduced over the recent years and fares have increased to the extent whereby the combination provides an unaffordable barrier for those on an average island wage, to venture off the island. This barrier has now in the 21st century, caused a continuing spiral of socio-economic deprivation while the surrounding South East mainland enjoys vibrant success and investment. PRO-LINK believes that with the natural topographical advantages of continuing to be surrounded by a stunning coastline, along with beautiful countryside – with easy and reliable access to it, the Isle of Wight will become the most desirable place in Britain to live, visit and perform business. The Isle of Wight can be given the opportunity to be successful. WHY IS THERE A SERIOUS LACK OF INWARD BUSINESS INVESTMENT COMING TO THE ISLAND? S1 – The privately owned and unregulated ferry companies control all cross Solent travel, they expose new business start ups and present island businesses to variable and unregulated transport costs. S2 – The unregulated ferry companies have total power, control and influence over any institution or business (mainland or island based) that requires cross Solent transport…this has a serious detrimental effect on business strategy and planning autonomy. S3 – The outdated method of unreliable, scheduled and time consuming cross-Solent ferry crossings, dissuades businesses from investing either initially or further on the island. The inefficient and slow sole ferry option causes wasted valuable time and expenditure, on unproductive hours. On average, a return vehicle journey consumes four hours of unproductive time plus administration booking procedures. S4 -The small population catchment area of the Isle of Wight, created by isolation from the British mainland dissuades consumer, entertainment and retail businesses from investment on the island. S5 – The extra fare expense and paid labour time to manoeuvre personnel across the Solent dissuades large company start-ups or reinvestment on the island. S6 – The prolonged time and extra variable expense for deliveries of base materials to the island and then finished products off the island, dissuades manufacturing businesses from investing on the island. S7 – Many hotels in traditional IOW tourist locations have become dilapidated due to lack of reinvestment. Owners have been reluctant to upgrade knowing that the return customer yield required to do this will not be forthcoming. Many have resorted to residential change of use. THE FIXED LINK once opened, will offer the solutions to these present drawbacks to businesses and institutions. A 24-hour, 365 days of the year road based 5-10 minute transport option, will allow island businesses to compete in the wider country and world market. Businesses in the 21st century need to have access to fast and reliable transportation of goods, personnel and customers in order to compete with those that have…. or they cannot succeed. WHAT ARE THE GAINS ENVISAGED WITH FAST AND REASONABLY PRICED 24 HOUR ACCESS TO AND FROM THE ISLAND? • G1 – Increased business and tourism inward investment. • G2 – The ability for island residents to commute easily and cheaply. • G3 – Island businesses to compete in a higher catchment area. • G5 – A boost to “career opportunity” island employment, through inward investment. • G6 – A boost to IOW Council revenue through less subsidising of council tax and business tax, via higher island wages. • G7 – The redevelopment of East Cowes waterfront ferry marshalling areas to provide facilities for locals, business/housing and tourism. • G8 – The redevelopment of Southampton Red Funnel waterfront ferry marshalling areas to provide facilities for locals, business/housing and tourism. • G9 – The redevelopment of Fishbourne waterfront ferry marshalling areas to provide facilities for locals, business/housing and tourism. • G9 – The redevelopment of Portsmouth waterfront ferry marshalling areas to provide facilities for locals, business/housing and tourism. • G10 – The avoidance of the potential emission charge that may be introduced, charging a levy to vehicles entering Portsmouth and Southampton city centres. • G11 – The avoidance of traffic surges associated with ferry disembarkation in Southampton, Portsmouth, Fishbourne and East Cowes. • G12 – The avoidance of traffic gridlock in areas of vehicle marshalling when ferries become delayed or cancelled. • G13 – The provision of reliable, fast and immediate, no toll charge transportation of trauma patients to specialist mainland hospital departments including other emergency services. • G14 – The fast and efficient utilisation of ambulances with staff, (consultants, doctors, etc.) operating between the island and mainland hospitals. • G15 – The reduced requirement to use expensive emergency helicopter flights for trauma victims. • G16 – The quick response of back up police, firearms, bomb squad, immigration services from the mainland. • G17 – The attraction of high skill set personnel including teachers, doctors, GP’s, consultants, industry specialists etc. who will not need to worry about the islands present day isolation; Thus avoiding the worry of career “dead ends”. • G18 – Social wellbeing for many who feel unable at present to visit mainland family and friends and visa versa, due to the burden of expense and problematic logistics caused by ferry unreliability and restrictive timetables. • G19 – An opportunity to contractually obligate a provider of a fixed link to provide funding for island transport infrastructure at construction stage, also to provide a small percentage funding from future tolls to provide ongoing input to the islands public facilities. The contractual obligations will need to include terms and conditions of future toll pricing to block increases that are not in line with normal rates of CPI. • G20 – Further education prospects will be enhanced for those wishing to attend mainland colleges and universities. By the same token, the idea of setting up of an IOW University may be easier to fulfill, with the opportunity of equal access for mainland students. • G20 – Sports careers will be enhanced by the ability of mainland participants, teams, trainers and coaches to quickly and reliably visit the island. Island teams and participants (children and adult) will also be able to compete and train on the mainland without the arduous and energy sapping ferry journey. The current climate of sponsorship of travel for island teams is limited. The availability for discounted travel for mainland teams to visit the island is non-existent. The option to use a fixed link would allow participants to arrange fixtures without the burden of financial and logistical encumbrances. • G21 – The gifted and talented will be able to remain on the island while still having the ability to pursue aspirational careers. • V1 – PRO-LINK’s vision is to obtain for all IOW residents, businesses and Island visitors a radical new choice to use regulated travel across the Solent, using personal vehicles or public transport. • V2 – To provide vastly improved, economic travel, efficient in speed, time and reliability, 24 hours a day throughout the whole year at fixed prices by road link travel. • V3 – We anticipate this crossing will be approximately four miles long with a crossing time of about six minutes – compared to an average minimum crossing time by ferry (including waiting time, embarkation and disembarkation time) totaling around 1.5 hours. V4.1 – Enable the aims of the Solent LEP to be more efficiently achieved. V4.2 – Enable the formation and economic benefits of a Combined Solent Authority to also be achieved. V4.3 – Enable better and more efficient use of resources, land and industry within the region. V4.4 – Enable island resident working people to commute to South Hampshire to higher quality and better-paid jobs. V4.5 – Lead to more investment in the Region as a whole, specifically on the Island providing better year round job security. V4.6 – Help ensure the supply of material goods and services on to the island and the dispatch of products off the island, are more reliably, efficiently & economically provided. V4.7 – Will better support and secure the “No.1 Island Industry”, encouraging more tourism and visitors. V4.8 – Will provide adequate future cross Solent transport for an increasing population. V5.1 – Obligated island resident and business discounted tolls and island “electoral register” only permits, will be pre-contracted and regulated in to the management system. V5.2 – Due to visual/noise impact, shipping/siting considerations and geological/maintenance concerns, we consider the crossing should be not be in the form of a bridge. V5.3 – Due to the undulation of the Solent seabed, the strong tidal stream nature, the sensitivity of the Solent waters environment and the length of the tunnel required, we consider the tunnel should not be an immersed tube tunnel. V5.4 – Due to the comparatively small environmental impact of boring a tunnel and the lengths suggested, a cross Solent bored tunnel system is preferable. • V6 – PRO-LINK understand that as this development will be an extension of the UK Road System, it would be adopted as such and will be carried out under the authority & terms of the UK Department for Transport. • V7 – As soon as the project is confirmed to go ahead, strategic investments will start pouring into the Island to prepare it for its future prosperity. • V8 – PRO-LINK believes that all existing passenger ferry services including Hovercraft and also the Yarmouth-Lymington vehicle ferry will continue to operate viably alongside the Fixed Link Tunnel, as they will not be working in direct competition. A management amalgamation of the Yarmouth to Lymington vehicle ferry route with the fixed link, to allow bookings from the same web site at the same time along with access to accommodation bookings, should enhance its use. Positioning the IOW Fixed Link Portal at East Wight, will keep the Yarmouth-Lymington Ferry away from the competition of the Link. It is thought that this most scenic of crossings will flourish due to the uniqueness and faster crossing time of this West Wight route. This route will serve well the “rural” tourist industry in West Wight and also any traffic that wishes to head West. It will be possible for tourist visitors to the island to choose between arriving by ferry or fixed link. It will give an opportunity to perhaps arrive by ferry and leave by tunnel or visa versa. • It is expected that the Wightlink Fishbourne-Portsmouth vehicle ferry route and the East Cowes-Southampton vehicle ferry route will be unable to compete with both the pricing and speed of Solent crossing within such a close proximity. It is therefore expected that these routes will cease. • TM1 – The construction of a Medina vehicle crossing. Included in the Fixed Link “Package” will be included a “Medina vehicle Crossing” (most likely, a bridge). The location required will be from Fairlee Road mid-way between Newport and Whippingham, to cross the River Medina towards Stag Lane. A connecting contraflow road would be required to be constructed on Eastern side from Fairlee Road. A small connecting contraflow connection on the Western side will also be required to Stag Lane. In order to pay for this infrastructure capital, it may be necessary to make a small “crossing charge” for each vehicle. Cyclists and pedestrians would be free. Once the capital has been paid off (expected 15-30 years), the crossing fee would no longer be necessary. The charge would need to be assessed. This crossing will alleviate much of the North West to North East traffic and visa versa that presently causes traffic problems at Coppins Bridge in Newport that subsequently can bring the area to gridlock. It is considered that the benefits to the IOW economy of this crossing will be enormous. • TM2 – The construction of an East to West Cowes Pedestrian Subway. At present, the infrequent and sporadic timing of the “floating bridge” which connects East Cowes to West Cowes for both vehicle and pedestrian crossings causes a bottleneck of traffic. At around midnight each day, this (charged for) service ceases to operate till around 6am. During this time anyone wishing to cross the River must journey some eight miles or so to cross a distance of 200 metres. The construction of a one-piece immersed tube pedestrian subway at this location will replace the floating bridge at East Cowes, offering an immediate 24-hour availability of crossing. This will create opportunities for East Cowes to become as successful as its neighbour to the West including 24-hour access to the Red Jet “high speed” option of crossing the Solent to Southampton. • Both TM1 and TM2 will have an initial charge rate of use until the capital outlay is paid. The two Medina crossings have no need to be staffed even at the initial toll charge stage, as automation will be simple to implement. • TM3 – The fixed link tunnel will offer concessionary rates if used between the hours of 2am to 5am. • TM4 – Heavy goods vehicles will be surcharged if using the tunnel at busy commuter times of 06.30 – 09.30hrs and 16.30 – 18.30hrs. • TM5 – Islander first homeowner only annual permits (on the IOW electoral register) will be offered at a rate not exceeding £2,000 for a standard family car. This will give two return journeys per day usage for those wishing to commute. This will allow vehicles to exit from the island while visitors enter, maintaining a balanced flow of traffic. Two types of permits can be offered – a full permit at £2,000 or a discounted permit, which will only allow crossings out of commuter hours similar to TM4. This should help “spread” the traffic to avoid surges. • TM6 – The Island will be annexed as a peninsula. Therefore traffic will not be entering the island to go elsewhere which would otherwise cause through traffic problems in other areas. • TM7 – During “peak tourist periods”, which will be stated in advance, a higher toll tariff will be employed to vehicles that are not registered as island based vehicles. This higher toll will be waived only if the vehicle owner has registered a “pre-paid accommodation booking” on the island. A web site based medium that island accommodation providers will need to register to, will discount the toll to a normal rate. This way, only those who have proven legitimate tourist related reasons to visit the island will pay the lower rate. Anyone else has two options: A/ pay the higher toll rate or B/ catch the bus through the tunnel, to continue on their journey by bus or be picked up by alternative transport, at the bus drop off point. • TM8 – Bus or taxi travel (most likely electrically powered at that stage) direct from major IOW towns to either Fareham train station, London, Eastleigh airport, Southampton, Portsmouth, etc. will offer a chance for people to leave their own vehicles at home. This will avoid the parking congestion that commuters cause at present, near ferry terminals on both the island and mainland. This increased electric bus activity will also make the island bus company viable to again provide public transport infrastructure to the villages that have had their bus routes removed. As more services are provided, more people will use the public transport buses, which will remove the single driver vehicles from the roads. With more people using the buses, fare prices will be liable to decrease. A license will be able to be bid for, with which to operate the service through the tunnel to incorporate pledged routes on the island. • TM9 – Only businesses registered as island based, will be offered annual permits. The prices will depend on the size of vehicles. This will allow island business vehicles to exit the island on essential business, while non-island business vehicles will be subject to standard priced return toll charges. • TM10 – “Automatic Number Plate Recognition” (ANPR) systems, combined with CCTV, car transmitters and on-line payments will create a seamless journey across the Solent, with no reason to stop the vehicle. (Similar to London congestion charge). • P1 – The above will be achieved by provision of two dual carriageway road tunnels each way under the Solent, to include safety provisions and suitable ventilation/service ducting. • P3 – The Island portal is ideally within the Whippingham area. There will be a requirement to create a new access from the A3054 Ryde Road at Lushington Hill and substantial improvements to Park, Briddlesford & Downend Roads providing a new south/central distribution route linking to the A3055 Newport to Sandown Road. Alternatively a new connective road could be constructed. • P4 – 85% of the islands resident population lives to the East of the West of West Cowes, when a line from that area is drawn North to South. To avoid unwarranted excessive traffic movements across the island to reach the Fixed Link Portal, the necessary positioning will be required where existing highest population areas already exist, but where space allows the construction of the Portal and infrastructure. In order to fund the construction of the Fixed Link, investors will require the yield versus capital outlay to be viable. An East Wight Portal will allow a connection towards the closest mainland options of the “Lee on Solent”, “Browndown” or if capital funds allow…further towards the M27. A mainland portal at any of these locations will allow the transfer of the predominant South East traffic. The newly agreed “Stubbington Bypass” could as aforementioned, be upgraded or modified to account for extra traffic flow. • P5 – Present day sporadic traffic surges within Portsmouth and Southampton city centres associated with the arrival and disembarkation of vehicle ferries, is not popular with the City authorities. Vehicles arriving in the City marshalling areas and beyond, either to embark or disembark, predominantly pass through the City with no economic value to the area. It is considered that both Portsmouth and Southampton City Councils would help mitigate some of the costs to improve the mainland portal infrastructure to the M27, if doing this would assist the reduction of traffic surging in their cities in the future. The Cities would also be able to redevelop the vehicle ferry ports in to better-used waterfront facilities. • B1 –The toll revenue from the route mentioned is estimated at £180million per annum with operational overheads of £5million to £10million (depending on build length, etc) = £170million to £175million profit. This constitutes an approximate yield of 95% overall minus leverage costs. The main tangible item (the Tunnel) is guaranteed for 150 years with guaranteed income for perpetuity. The cost to build the tunnels/infrastructure is assessed by experts at £1.2billion < 30% >. Leverage costs @5% = £60million per annum. £170million profit minus £60million leverage costs = £110million profit. 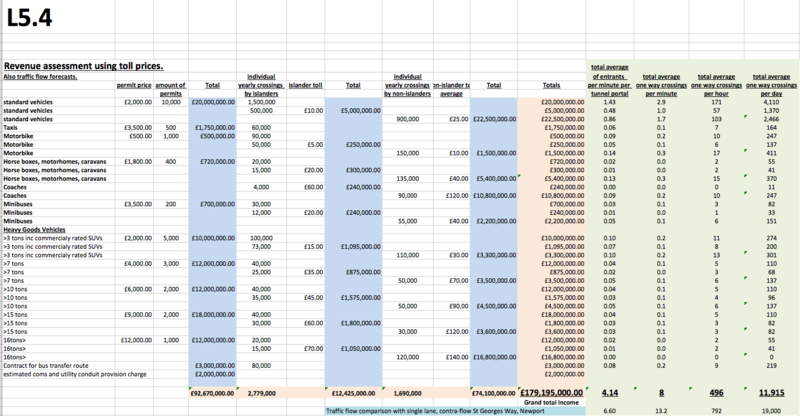 £40million average leverage costs (two thirds of final cost leverage) x 10 years of construction = £400million. £1.2billion construction costs plus £400million leverage = £1.6 billion to build. £1.6billion leverage costs @ 5% = £80million per annum. £170million profit minus £80million leverage = £90million. £1.6billion divide by £90million profit per annum = 17.8 years. • B2 – The existing combined revenue of Red Funnel and Wightlink including passenger ferries is approximately £105million per annum with £80million overheads = £25million combined profit. This constitutes an approximate yield of 24% (including leverage costs we believe, but this needs to be confirmed). Tangible items are devaluing (the ferries), requiring replacement every 15-20 years. The ferry companies have massive overheads via an outdated system of labour and maintenance intensive transport to cross a short distance of water. A Fixed Link Road based tunnel has fewer overheads, especially using new technology. • TE1 – Bored tunnels will not interfere with the Solent seabed. • TE2 – Construction excavation spoils can be used to infill and reclaim land, or be deposited in the English Channel causing no harm. • TE3 – The tunnel portals can be unobtrusive. • TE4 – The tunnel will be powered by clean electric energy with low energy lighting and ventilation. • TE5 – The tunnel will provide conduits for island generated solar/tidal power. • TE6 – The tunnel will facilitate the use of driverless electric cars for transport across the Solent in the future. • TE7 – The tunnel will facilitate the use of electric buses for public transport across the Solent. • TE8 – Automation avoids requirements for vehicles to stop, saving energy through efficiency of momentum. • FE1 – Fossil Fuels are required to generate propulsion and electricity. Modern ferries can now be hybrid, but will still require fossil fuel power. • FE2 – Lack of fluid motion with extended stationary periods in dock, wastes energy while not providing transport. • FE3 – Large administration and ticketing buildings waste energy. • FE4 – Slow moving and stationary waiting vehicles embarking and disembarking, use energy inefficiently. • FE5 – Ferries are often only partially utilised or even empty when crossing the Solent, causing energy to be wasted needlessly. Pro-Link believes the island economy will be boosted by a fixed link in many ways. • E1 – Strategic inward investment into business start-ups, plans for tourist attractions, hotel upgrades and new builds, etc. are expected to be forthcoming even before tunnel construction begins. • E2 – Inadvertent but valuable Isle of Wight destination promotional advertising, will occur through the worldwide media attention that this project will receive. • E3 – Housing will be required for the workers, along with peripheral eateries, shops, etc. the construction will continue for perhaps 5-7 years, providing employment to local labour also. Continued inward investment along with the building of the planned Hotels and businesses to have them realised as the tunnel opens will create a construction boon. • E4 – The unique 55 miles of coastline with its 27 beaches, will provide the unusual criteria to make the Isle of Wight a mecca for watersports activities, now that enthusiasts are able to access the area and equipment businesses, that will have been prepared during the tunnel construction years. • E5 – The easy commuter access will help bring Island resident average wage from the £18,000 per annum to parity of the £25,000 South East average. The 80,000 working age population will have a chance to lift the input of the extra average wage, into the island economy by over £500million per annum. • E6 – Island Technology and other businesses will be able to expand by attracting high skill set employees that are at present reluctant to locate on to an isolated island. • E7 – Extra footfall numbers through the towns and villages will facilitate viable shops, restaurants, bars and clubs. • E8 – The burdensome expensive “tax by ferry fare” for island residents to leave and return to the island will be removed. C1 – PRO-LINK believe that the contents of this statement show beyond reasonable doubt the massive potential that a Cross Solent tunnel road link will have for the future socio-economic prosperity, lifestyle and standard of living on the Isle of Wight. 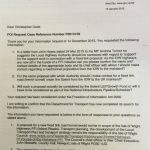 After proper examination of our statement, we believe the Transport Infrastructure Task Force will have a responsibility and duty of care, to press the case to the IOW Council to formally request the Department for Transport to commission an updated and thorough IOW Fixed Link Feasibility Study and if possible, to planning application stages. We believe the new study will enable a proper informed debate to take place throughout the Solent for those who will be affected. 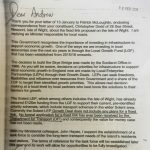 • L1 – A letter from the DfT dated 7th October 2014 in reply to Kevin Price who asked why there is no Fixed Link to the Isle of Wight? “The setting of fare rates for residents is a matter for the operator of the service, as a private company. It would not be appropriate for Central Government to legislate a rate of fare which could make the service less able to adapt to changing circumstances”. 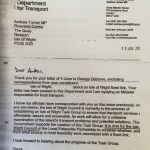 • L2 – Letter to Christopher Dodd from James Sharples of the DfT dated 13th January 2015. 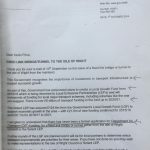 This letter explains that the IOW Council and the Solent LEP are to make the decision regarding an IOW Fixed Link. • L3 – Letter to Andrew Turner – MP. From Robert Goodwill – The Department for Transport. Dated 12th February 2015. • L4 – A letter to Andrew Turner – MP. From Andrew Jones – Parliamentary Under secretary of State. Dated 13th July 2015. “It is now for the Isle of Wight Council or the Local Enterprise Partnership to consider whether, and from what source, to fund feasibility work associated with a fixed link”. 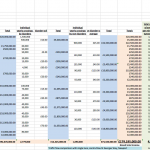 • L5.4 – “Spreadsheet of Traffic flow and revenue forecast”. The estimated income and traffic flow derived from doubling the numbers of present day cross Solent vehicular movements. The toll charges will be 50%-90% cheaper than existing ferry fares. Powerful reasoning for the case of an island fixed link to the UK mainland and represents great investment opportunities.